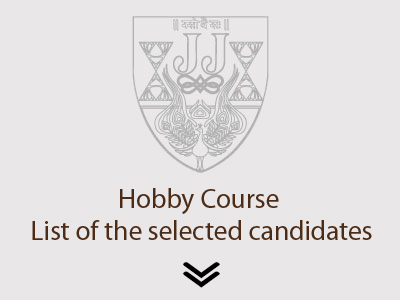 The Hobby Course Program was conceptualized with the aim to promote and educate art amongst those who haven’t had the opportunity and the time to pursue art as a degree as a student. The courses under this program are specifically aimed for working professionals and seniors providing them with a second chance to pursue this dream—that of studying and learning art under the guidance of Sir J J School of Art combined with flexible timings. Keeping in mind the objective of the program and restricted number of seats in the Hobby Courses, the merit list will be decided only on the basis of the applicant’s seniority and the marks obtained in their SSC marksheet. 75% attendance is compulsory. 75% assignments are compulsory.